Ok. YOU MUST SEE TRANSFORMERS!!! This is the best movie in a very long time. In the begining I thought that it was going to be a good sci-fi action movie. 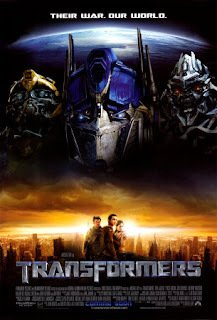 I was waiting a lot for this movie just because it is Transformers, but I didn't expected to be this good. I mean, it surpassed all my expectations about the movie, even when my expectations were very high. For example, the second part of Fantastic 4, I just wanted to watch it because of Silversurfer, but I didn't expect to be a great movie. And as expected, it wasn't a good movie at all. I just liked the Silversurfer. But this movie... WOW!!! I don't have words for this movie. So cool!!! There are few things I didn't like, but the good things are way better than the things I didn't like. The sounds when they transform are just as the original cartoon TV series, they kept all the names of the Autobots and the Decepticons. There were some little changes, but for good, like Bumblebee instead of being a VW Beatle, nos is a brand new Camaro 2008. The hole movie is advertisement. All Autobots are GM cars, for example. (Bumblebee - Chevrolet Camaro Fifth generation / Jaaz- Pontiac Solstice / Ironhide - GMC truck / Ratchet - Hummer). And it is only a little bit. But yeah, they anounce a lot of things in the hole movie. The computer animation is very good, almost real. The dialogs and some situations are hilarious. The plot is very well developed. This is a movie you must watch. now you know my blog.